I have been following this forum since I decided to build a DLP 3d printer and the first thing I missed was an electronic board that could handle the printing process by it's own, without a PC like almost any FDM 3d printer. I wanted to make my own board and I have some programming skills but I lacked a good electronics background, so I started to learn pcb design and electronics. Now I'm still a bit newbie to the electronics world but I have a first prototype in a protoboard (that can handle one stepper motor, a 16x2 display, some buttons, and powers the pi by itself to avoid extra power cables) and a first piece of software that reads the files generated in Creation Workshop and moves the stepper motor. 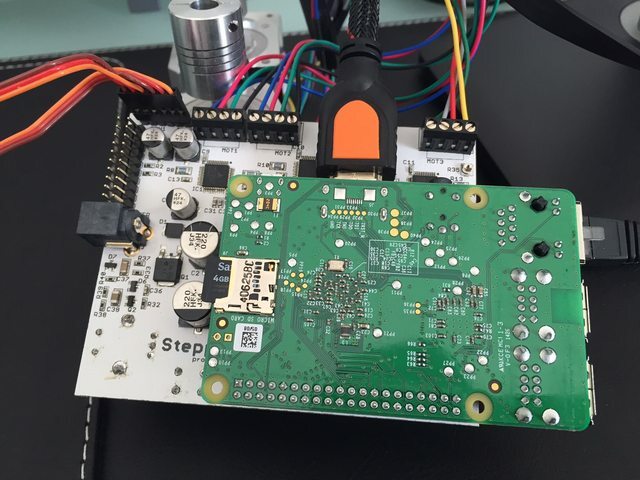 The problem I found is that the Raspberry Pi is not capable of doing realtime tasks like sending step/dir pulses to the stepper drivers, and the motors are not moving smoothly. This could cause step missing because sometimes the motion stops and starts abruptly in the middle of a move. That being said, what would you want to have in a raspberry pi shield for your DLP 3d printers? this driver is awesome, the current of the motor is easily configurable by the user in software, and the driver adjusts the current depending on the load of the motor. Another cool feature is that you can have 1/256th microstepping with a 1/16th microstepping resolution (16x200 = 3200 microsteps per rev, or 0.0025mm resolution with an 8mm leadscrew) that I think it's more than enough for a high res Z axis, while the 1/256th microstepping runs the motor smoothly. My idea is to use a pair of TMC260 with a TMC429 motion controller so that the pi has not to handle realtime tasks. Also, is there anybody using a servo for something? I am considering adding a servo output, but it may not be necessary. a third stepper would be useful as to maybe controlling projector distance for variable XY resolution. A servo is used in most cases to open/close a shutter in front of the projector lens to stop accidental exposure when the projector is powered on (splash screen) for example. 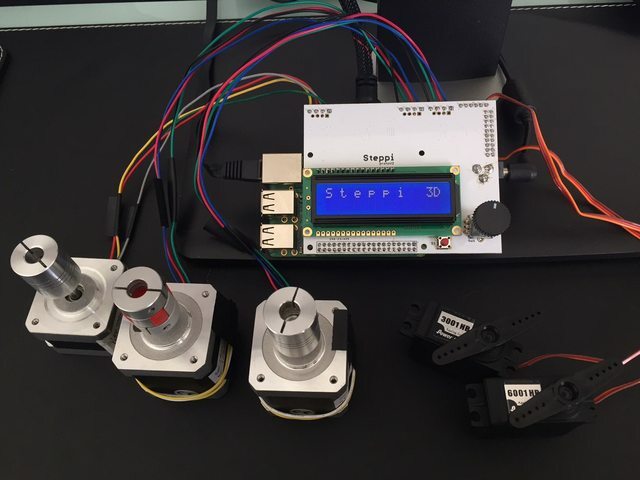 Another cool feature of the trinamic steppers is the StallGuard, which allows for homing without endstops by simply monitoring motor current and stopping when the motor hits an obstacle (vat). First of all, hello from Indonesia! I'm a total newbie and this is my very first post in the forum. I think this is great that someone is working on Raspi to build a standalone DLP printer, and I'm really excited to see how far this development can go. I'm in the process of building my own printer. I was stuck due to my complete lack of knowledge and skill in regards of micro controller and the controlling of it. So I sent Steve a request for help and he gave me some really good advice. Originally, all I wanted was to build a top-down printer, simply because it's the simplest configuration. But now I really would like to have my printer built as a standalone unit, not having to have it connected to my PC when it's printing. @ciclopez: Have you finished your project? How is it going now? currently i'm using raspberry pi + adruino + ramps shield.. Using a Pi with Creation workshop is not an easy task. I would focus first on getting your controller working, running tethered to a PC. I can't say anything more -- you've given us zero information about your specific printer, so there's no way we could help you. I suggest making your own thread (with pictures, if possible) detailing any problem you may have. I wanted to show you some images as a quick update about this project. The hardware seems fully functional but still needs a lot of software development because I decided to use a new Trinamic chip, the TMC5130 instead of TMC260 + TMC429. As soon as I have some real printing tests I will upload a video to show functionality in detail. Nice job! Let us know how it is performing. I am working on something similar, however for galvo-based SLA/SLS systems. I am currently building first prototype - galvo control part is working, stepper and end-stop part is completely missing It is running on my own cloud-based software. 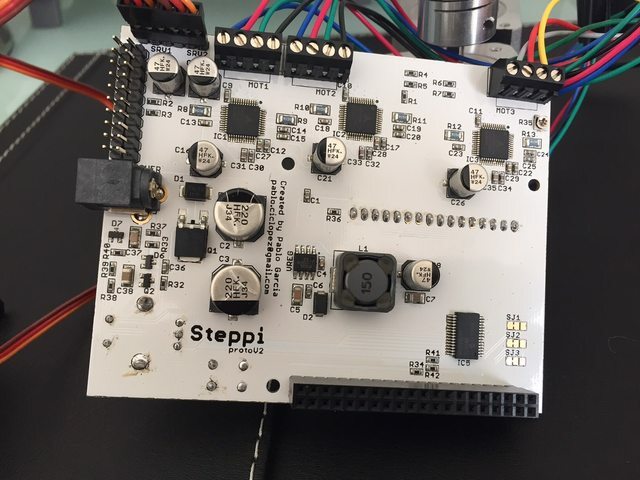 I was not aware that stepper drivers with integrated controllers as TMC5130 are available. I will definitely consider it for my board. 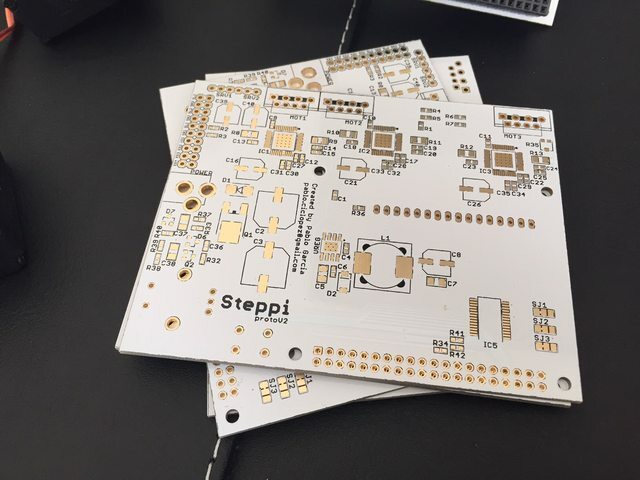 My intention was to equip the board with 2-3 positions for Pololu stepper driver modules. I did not test it yet, however I was expecting unsatisfactory performance without additional MCU. Is there something like TMC5130 but designed for multiple steppers controlled by single interface (SPI, UART)?